A guide on how you can make money in the current market. Indian equity markets have been in a sweet spot this year. 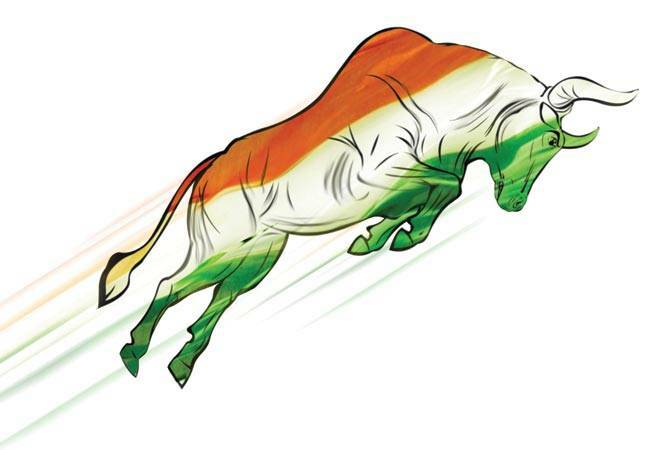 The BSE Sensex has risen 8 per cent and the Nifty 9 per cent on a year-to-date basis. Mid-cap and small-cap indices are trading near their 52-week highs. Several pockets in the mid- and small-cap space have returned more than 20 per cent over the period. "Markets are riding the wave of optimism, thanks to good monsoon and signs of recovery in India Inc's earnings. Favourable cues from the latest meeting over the GST Bill between the finance minister and his state counterparts have also helped," says Jayant Manglik, President, Retail Distribution, Religare Securities. Now, the question everyone is asking is, will this rally continue? Market experts say improving domestic trends, especially good gross domestic product, or GDP, growth in a world where most economies are struggling, mean the joyride is likely to continue. However, in the event of any extreme negative global event, India won't be spared and foreign institutional investors will take out money, impacting stock markets, they say. They list five factors that will help the country's stock markets touch new highs provided the global economy does not turn very bad from here. One of the major features of the current rally is the faith in India shown by foreign investors. In July, foreign portfolio investors, or FPIs, pumped in Rs 10,126 crore into equities, the highest in four months. Similarly, the debt market got Rs 6,862 crore, the highest monthly inflow this calendar year. Going forward, the trend is likely to continue, thanks to the 'risk on' mood in global markets. "With liquidity conditions improving across the world, more money is likely to find its way to emerging markets, especially India," says Sunil Sharma, CIO, Sanctum Wealth Management. A few days ago, Japanese Prime Minister Shinzo Abe said his government would unveil a stimulus package worth over $265 billion (28 trillion yen) to boost the country's economic growth. Market observers say the European Central Bank will take similar measures, most likely in its next meeting. Some part of this liquidity glut is likely to find its way to India, helping stocks here. Also, the fear that the US will increase rates - which will make foreign investors take out money from emerging markets and dry up liquidity - has waned due to economic uncertainty after Britain voted to leave the European Union. After a slow start in June, monsoon picked up pace in July. The rainfall deficit is now almost zero. Spatial distribution of rainfall, too, has been good, with all regions (barring East) receiving normal rain. As a result, by the third week of July, nearly 65 per cent kharif sowing had been completed. The area under pulses is up 40 per cent year-on-year. This will help the government control high prices of pulses, a major cause for high consumer price inflation or CPI. According to Kapil Gupta and Prateek Parekh of Edelweiss, this augurs well, not only for farm output, but also for inflation in specific items such as pulses, whose prices have been rising by 25 per cent year-on-year for the past 13 months. A good monsoon will lead to a bumper harvest and put more money in the hands of those who live in rural India. According to a Bank of America-Merrill Lynch report, pick-up in rural demand is expected to lead to consumption recovery in the second half of the year. Another aspect that is expected to push up consumption is the expected bounty that nearly one crore government employees and pensioners will receive after the implementation of the 7th Pay Commission. These two factors, leading to higher incomes, are expected to trigger an increase in spending on white goods and automobiles. In anticipation, several pockets in the markets have already started rising. The much-delayed Goods and Services Tax (GST) is finally inching towards becoming a reality. "The recent stock market rally has been triggered by hope that the GST will come into effect from April 2017. It holds promise for a plethora of sectors," says A.K. Prabhakar, Head of Research, IDBI Capital Markets. It will give a big boost to the economy and the market. The new tax will effectively subsume a plethora of indirect taxes such as value added tax , service tax, excise duty and octroi. This will lead to cost savings and make the economy more efficient, increasing GDP. 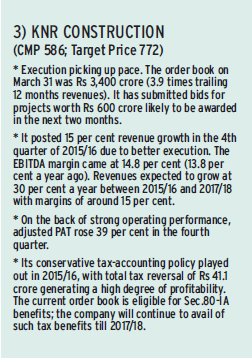 "The GST will provide a push to earnings in the long term and lead to re-rating of valuations in the near term," says Vinod Nair, Head of Research, Geojit BNP Paribas. Good monsoon and lower prices of food (major cause for high CPI) mean the Reserve Bank of India may cut interest rates in the coming months. "However, the risk to this assumption is excess rainfall damaging crops," says Prabhakar. This is one factor that has been disappointing market players for a long time now. However, since the last quarter, there have been encouraging signs of improvement in earnings of companies, barring in banking and metal sectors. "There is a mismatch between earnings and stock prices in several pockets. In the longer term, share prices will have to be driven by earnings and the pace at which they grow," says Mahesh Patil, Co-Chief Investment Officer (Equities), Birla Sun Life Mutual Fund. Sanjay Dongre, EVP and Senior Fund Manager of UTI Mutual Fund, says the worst of earnings seems to be over. "The March quarter results saw more companies beating than missing estimates. 2016/17 & 2017/18 earnings upgrade cycle seems to have started, especially in domestic cyclical sectors," he says. 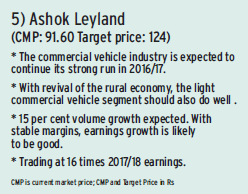 He projects that earnings growth is expected to be 15 per cent-plus in FY17 due to higher government spending, lower interest rates and soft raw material prices, all of which will lead to improvement in margins. 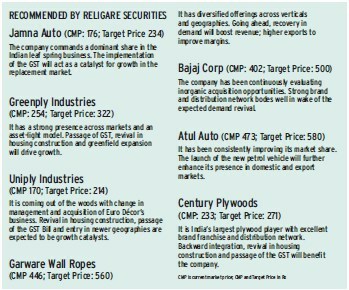 Mid-cap and small-cap stocks have been on fire, outpacing benchmark indices, over the past one year. Recently, the BSE Mid-cap Index crossed the 12,000-mark for the first time. It is trading at an all-time high valuation, last seen in January 2008, of 33 times 12-month price-to-earnings (P/E) multiple. As a result, several market experts recommended partial profit-booking on fears the euphoria may end. Some experts say the rally was fuelled by increased participation by both retail and institutional investors hoping to find an emerging large-cap name early in the cycle. Pankaj Tibrewal, Senior VP & Equity Fund Manager who manages the mid-cap funds at Kotak Mutual Fund, says, "While broader mid-cap valuations appear expensive, the mid-cap and small-cap universe is very diverse. Headline valuations may not represent the stock-specific opportunities available." He further says, "Many companies have improved their balance sheets and have significant operating leverage. This, combined with improving demand environment, can lead to substantial profit growth in the coming years. So, while valuation multiples may not expand materially from here on, earnings growth will drive returns." When asked if there is any pocket he would avoid due to stretched valuations, he said at a broader level, valuations of some NBFCs/microfinance companies along with some commodities/metal companies appear stretched. In the latter, he says, the current prices are not factoring in the global overcapacity in many of these commodities. So, if one is tempted to take buy at current levels, it is best to ensure that the company has a competitive edge, a scalable model, decent cash flows and accounting profits. One must also check the quality of the management. And, finally, the most important point while investing directly or through a mid/small-cap mutual fund is - have a long-term horizon. Mid-caps can be volatile in the short term but investments selected after proper analysis can generate good returns in the long run. Experts say investors should focus on automobile, consumer durables and financial services sectors. Stock plays around capex recovery, they say, will show mixed results. Though there has been some traction, constraints are likely to emerge as any sharp pick-up in private sector capex remains a distant dream. Jinesh Gopani, Fund Manager, Axis Mutual Fund, says, "The capex cycle is seeing initial signs of uptick led by government spending in sectors such as roads and railways. However, private sector capex is likely to remain muted for some more time as companies struggle with high debt, low capacity utilisation and weak demand. With earnings expected to turn around, we expect that the corporate capex can revive in the latter part of the cycle in one-two years' time. In this context, government spending on infrastructure will be crucial to kick-start economic growth." The logistics sector, especially companies in road transport, is seen as a major beneficiary of the GST as fast movement of goods will be the key to the success of the new regime. The other gainers will be media and entertainment sectors as their effective tax rates may fall. 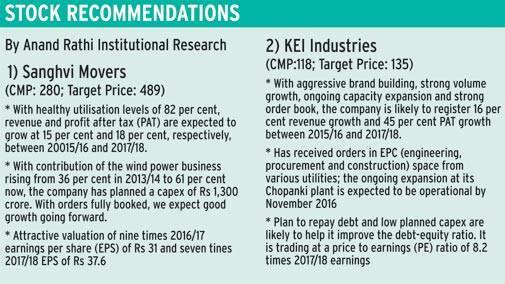 Amara Raja Batteries, Greenply Industries and Symphony will also benefit, according to IDBI Capital. Patil of Birla Sun Life says it will not be surprising to see equities face headwinds in the near term but the mid- and long-term outlook remains robust. Any steep market correction can be an opportunity to buy, he says. The fund house is underweight on IT due to moderation of the growth rate and telecom due to competitive intensity and higher capex requirements. Banks, NBFCs, cement and select downstream oil companies are his favourites. Gopani of Axis Mutual Fund says valuations are broadly reasonable. The Indian economy is going through a cyclical upturn and growth should get stronger over the next couple of years, he says. What will make India attractive vis-Ã -vis other emerging markets are macro drivers such as strong GDP growth, twin deficits under control, favourable commodity cycle, benign inflation and the government's focus on reforms. 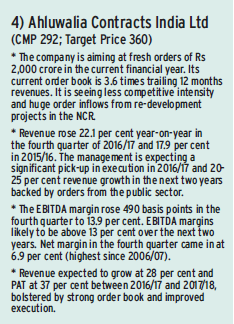 Over the medium term, earnings should start reflecting the improvement in the growth environment. "Any correction should be taken as an opportunity for the long term since there are chances of further improvement in earnings led by global liquidity, reforms like GST & Make in India, and improvement in the domestic market due to increase in incomes," says Nair of Geojit BNP Paribas. He says improvement in earnings is a must for the market outlook to improve significantly from current levels. Their best and worst case scenario for the Sensex are 30,500 and 24,800, respectively. Sector-wise, we are positive on banks, auto, infra and chemicals, he says. No analyst spoken to said the upmove will be a straight line heading north. Most say that in case of a global accident, a risk-off action is bound to happen, which can seriously dent the gains made thus far. However, as long as liquidity prevails, India remains a preferred market. As Sharma of Sanctum Wealth Management puts it: "India's hour on the global macro stage has arrived. Rupee is strong, bonds and equities are rallying. Global and domestic investors have no choice but to take notice."